Some 60,000 years ago, a small group of people landed on Australia’s northern coast. They were the first oceanic mariners and this great southern land was their new home. Gigantic mammals roamed the plains and enormous crocodiles, giant snakes and goannas nestled in the estuaries and savannahs. First Footprints tells the epic story of Australia’s Aboriginal people. It is a story of ancient life on the driest continent on earth through the greatest environmental changes experienced in human history: ice ages, extreme drought and inundating seas. It is chronicled through astonishing archaeological discoveries, ancient oral histories and the largest and oldest art galleries on earth. 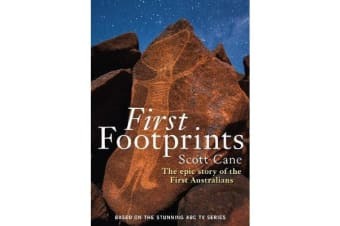 Australia’s first inhabitants were the first people to believe in an afterlife, cremate their dead, engrave representations of the human face, and depict human sound and emotion. They created new technologies, designed ornamentation, engaged in trade, and crafted the earliest documents of war. Ultimately, they developed a sustainable society based on shared religious tradition and far-reaching social networks across the length and breadth of Australia.